We are pleased to offer for sale this 2x Magnifying Glass ERGONOMIC Handle Hand Held 4" Glass Lens Magnifier by SE. This 2x Magnifying Glass features a glass lens and sturdy plastic body with an ergonomic handle. 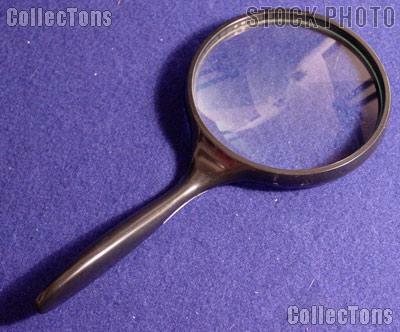 The 2x Magnifying Glass has a 4 3/4" handle and 4" diameter glass lens. These 2x Magnifying Glasses are 2 power magnifiers with sturdy plastic construction. These 2x Magnifying Glasses are new from our inventory.